We tend to think of national energy systems as closed, but coal, natural gas, and other forms of energy flow within and between countries based on a complex mix of factors. How countries produce and use energy; how much energy they import and export; and how it is converted into transportation, heating/cooling, and the production of goods and services can vary widely and is dependent on a global system. To better understand that system, the Wilson Center has developed a new interactive infographic, “Tracking the Energy Titans.” Drawing on data for the United States, China, and Canada, users can compare national energy trends in consumption, production, imports, exports, and environmental impacts between three countries with important trade ties. A production of the Wilson Center’s China Environment Forum, Canada Institute, Environmental Change and Security Program, and Science and Technology Innovation Program. Designed by Radish Lab. Special thanks to Christian Ostermann. As major users and producers of energy, the United States and China were obvious choices. Canada provides an interesting case study of a major world energy producer with a smaller population. The country ranks among the world’s top 10 in natural gas, electricity, and petroleum production. At the same time, Canadian energy production is inextricably linked with U.S. consumption. While dwarfed by the United States and China by population and GDP, Canada punches well above its weight when it comes to energy. Not only does Canada have the world’s third largest oil reserves, it is the fourth largest producer of natural gas. 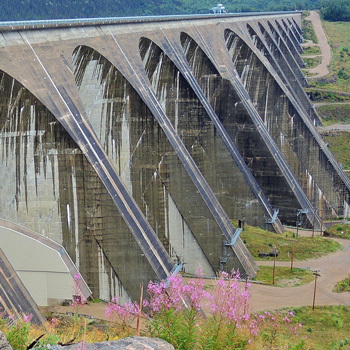 Its hydropower potential could also help the United States transition to cleaner sources of energy. For more, follow the China Environment Forum, Canada Institute, Environmental Change and Security Program, and Science and Technology Innovation Program on Twitter. 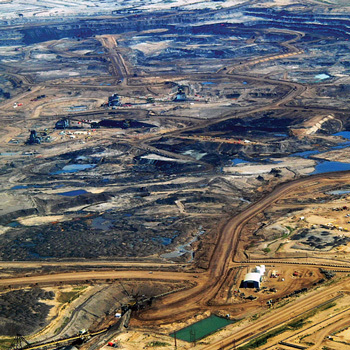 Photos: Alberta tar sands, courtesy of flickr user Howl Arts Collective/Dru Oja Jay; Powerlines in Osaka, Japan, courtesy of flickr user kenmainr; Daniel-Johnson Dam, courtesy of flickr user François Cataford. Page designed by Schuyler Null.